Online slot developer IGT have plenty of history in the solid video slots world, both in the land-based and online arenas. Are You a Fan of Stacked Wilds? 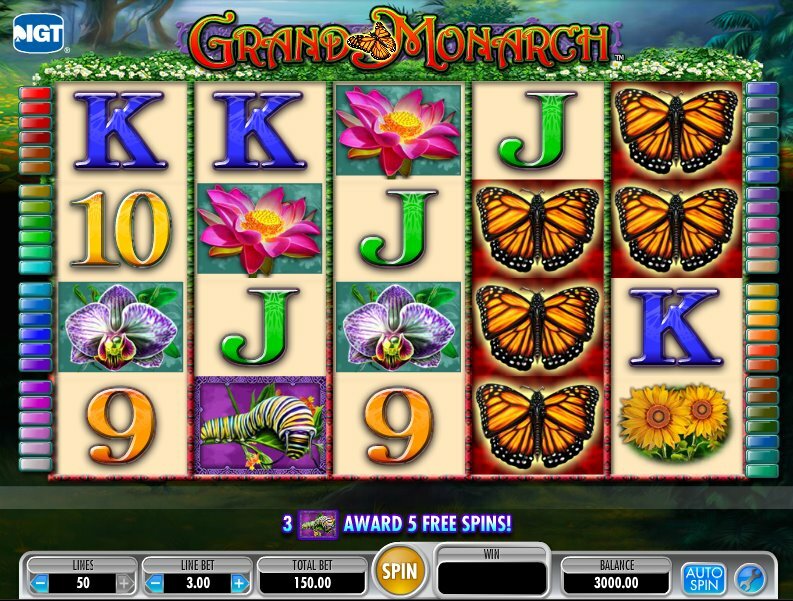 Their nature-themed video slot, Grand Monarch, is the latest solid addition to their games suite. Well, solid if you’re a fan of Stacked Wilds and stingy free spins bonus rounds, that is. If you were expecting a game filled with kings, queens and castles, think again. 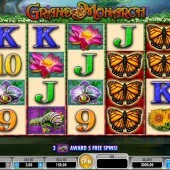 The ‘grand monarch’ of the title is actually the monarch butterfly, which forms the main symbol in this 5 reel, 50 payline (yes, 50) slot. Bets start at just $0.01 a coin so all wallets are catered for, but there are still some attractive jackpots to be had, even at the lower end of the stakes. The butterfly symbol acts as the game’s Wild and it substitutes for all regular symbols in the game other than the Caterpillar. Five Wilds pays out a jackpot of 1,000 times your total line bet, but there are more winnings to be had from the other regular symbols, including various flowers for the butterfly to visit, plus some basic 9-through-Ace symbols. Free spins – five of them – can be won by hitting three caterpillars on reels 2, 3, and 4. You’ll win 2x your total bet on top of the spins, and the round can be re-triggered. However, despite the prospect of re-triggering spins, I still found a flat five on offer pretty miserly, and that’s not even taking into account the fact that you have to hit the Scatters on three specific reels to start off with. Some pretty graphics aside, IGT’s slot falls a little flat down its poor bonus round. Stacked Wilds are fine for those who like lots of small, regular wins during the base game, but I’m a sucker for generous bonuses so I’ll be steering clear of this in future. As for better nature-themed slots on the market, check out Sheriff Gaming’s lush 3D fun-fest, Bugs, or the awesome insect-themed Cashapillar slot from Microgaming.